They say behind every successful company, lies a great story. It's not different with Indochino. According to their website, Heikal Gani had troubles finding the right suit for a conference. Unable to find anything that fit both his budget and taste, he decided to take matters into his own hands. He teamed up with fellow student and friend Kyle Vucko and in 2007, Indochino was born. Kyle, the CEO runs the business from Canada, Heikal, the CCO (Chief Creative Officer) is responsible for design and production in Shanghai, China. Today, Indochino is the largest online retailer of customer suits in the world, with over 50 employees and customers from (almost) all over the world. First of all, many thanks for taking the time for doing this interview! I am sure you must be very busy at the moment, the business seems to reach new heights. How did the year 2010 go so far for Indochino? So far the year has been great for Indochino. We’re not even half way through and already we’ve expanded exponentially. It’s exciting, we have some exciting things still to come in 2010. There are a number of companies on the Internet, offering similar products as Indochino. How is Indochino different from these companies and what is your unique selling point? When Indochino began in 2007, we were the first in the space and it’s great to see that custom-made menswear online has grown into its own pocket of the industry. There are a number of things that still set us apart including the way we release new styles at a rapid pace and the close contact we have with manufacturing which allows us to have control over quality assurance. We are also still the only company that can deliver a suit in under two weeks and back it up with a Perfect Fit Promise. What is the general direction for 2010? Overall, will you focus on growth, new product lines or rather on further improving quality and customer satisfaction? We are focusing on all of these. Expanding product lines means finding more compelling fabrics and continuing to refine our construction quality. Plus, the way towards growth is by listening to our customers and providing them with the best service and products possible. You are clearly getting a high number of new customers from all over the world every day, but how high is the share of returning customers? Close to half of our sales right now are from returning customers. Once measurements are taken and the first suit is made, it’s just point, click, and buy. Indochino has a lot of fantastic, loyal customers. According to your data, how high is the number of remakes? Indochino has a 4% return rate, much lower than the 20%+ industry norm, which is in thanks to our Perfect Fit Promise which offers the option for alteration credits and remakes. Every customer is unique, and every purchase different, so our focus is to ensure that the final outcome of every purchase is for the suit/shirt/blazer to be the perfect fit for each customer’s taste. Many customers are concerned about buying products produced in China and other parts of Asia. What can you tell us about the working conditions/the contractual situation for Indochino tailors? Can customers make a purchase with a clear conscience? Absolutely. We have partnerships with our tailors and Indochino’s products are based on their craftsmanship, so we’re not just outsourcing to an unknown factory. A master tailor comes into our office every day and we work very closely with the team to ensure their working conditions are great and their compensation is higher than similar positions in Shanghai. A bespoke tailor I recently spoke to, commented on the construction of Indochino suits. He believes that Indochino decided for a rather uncommon approach of interlining the suits (both fused and canvassed, no canvas on the lapels). Can you shed some light on the background of this decision? We made the decision to construct our suits that way in order to provide the best quality construction at an affordable price. I believe we are the only apparel company who provides a full-canvas interlining at the price point we offer. There are varying opinions on suit constructions and we continually monitor this to ensure the best possible product is created. From next week onwards, customers can expect canvas throughout the lapels too. While most reviews on the Internet seem to be very positive overall, many are not perfectly happy with the shoulders. More specifically, the criticism goes towards the little support in the shoulder part of the chest piece that can make them appear a bit lumpy. What is your opinion on this? We have noted that there’s a section of our customer base that would prefer a different type of shoulder construction, so starting next month we will offer the option of natural shoulder construction as well as the lightly padded shoulders we have now. You are providing great, detailed videos on how to measure yourself. Still, many people seem to be unsure about how to do it correctly. Many people claim that for getting a slim suit as seen on your models, you have to take a few inches off each measurement. What do you recommend doing? 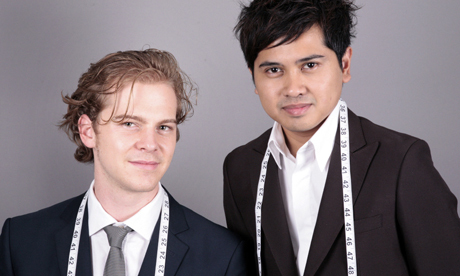 Taking the time to measure is key when following our videos on Indochino.com. And also be as precise as possible with your height and weight. A question asked from Style Forum members: Do you plan on expanding the style of linings offered or perhaps even more fabrics to choose from? I think it's fantastic how quickly you come up with new styles, new suits that are just right for the season. Some of the linen suits for example look mouth-watering! How do you get your inspiration? Our goal is to create compelling products that wow our customers, the inspiration for this takes many forms: Customer insights, industry trends, and what people actually buy from Indochino to name a few.